Opportunities comes in many forms. Take for example the opportunity to save money by winterizing your home. Taking just a few easy, affordable steps can put money in your pocket all winter long. Here are seven hot tips for saving cold, hard cash. Hot water pipes radiate heat into the surrounding environment, taxing your water heater and draining your wallet. The good news is that there’s a cheap fix for this problem: foam insulation. You can buy this material in flat sheets or use pre-slit wraps that will fit your pipes with precision. Not only will this save you money on utility bills, it can spare you from the catastrophic costs of repairing burst pipes in the winter. Defective ducts can account for as much as 30% of your monthly heating bills, according to Uncle Sam’s EnergyStar Bureau. You can pay a contractor to fix these problems or tackle the job yourself. If you go the DIY route, then make sure you use mastic compound or metal tape, not duct tape. The small difference in price between these products will more than pay for itself with longer lasting, more effective repairs. A draft snake is a thin piece of wood, often round, with insulating fabric wrapped around its exterior. Homeowners use these products to block drafts along the bottom edge of doorways. These items are not only practical, they’re also downright cute! You can make them yourself or find them at retailers that sell household goods. Most ceiling fans have a handy reverse switch that draws air away from, not towards, the ceiling. Using this feature can slash your heating bills by as much as 10%. The process works by recirculating warmer air into the center of the room, making your home more comfy for less money. You can make the switch by pushing a button on the housing or by pulling a length of chain that hangs from the unit. Consult your owner’s manual for details. It only takes seconds to start saving money with this tip. 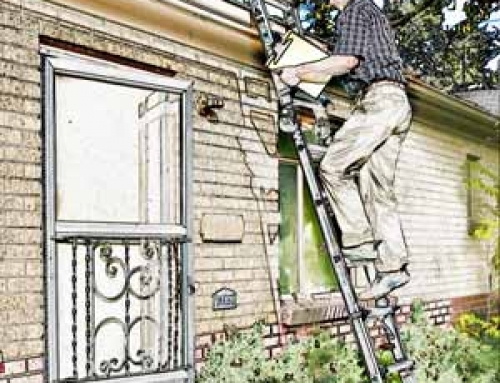 You probably already know that cleaning your gutters is an important change-of-seasons ritual. But did you also know that installing gutter covers is also a wise move, according to the people at Popular Mechanics? Covers cost as little as $1.30 per linear foot, yet they can save you hundreds or even thousands of dollars in home repairs. Here’s an added incentive for winterizing your home: it may reduce your tax bill. The government offers a variety of credits for performing energy efficiency projects around your home. Some of these discounts are substantial. This is just one more reason to winterize your home. Afterwards you can relax and think of all the money you’re saving in exchange for a little bit of effort. That’s a thought which is sure to warm even the coldest heart this winter season.